Kathy Page, originally from England, is best known for her realist fiction. Her recently republished prison novel, Alphabet, has been praised for its gritty fidelity to the prisoner’s experience in the English penal system. 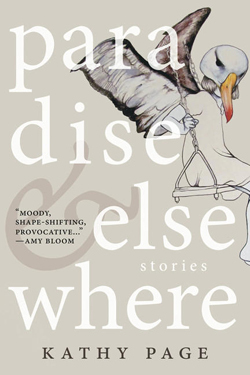 Page’s editor, John Metcalf, admitted to her that he has a McEwanesque “prejudice against non-realistic writing,” and was therefore reluctant even to read the manuscript of Paradise & Elsewhere (Biblioasis), which Page had submitted at the same time as a collection of more conventional stories. When she prevailed upon him to give the fabulist book a chance, it turned out that he liked it a great deal. As have many readers and awards jurors, perhaps because of the very archetypal nature of the collection’s tales. Tolstoy, who looked to the art of the peasantry for models, famously said that “all great literature is one of two stories; a man goes on a journey or a stranger comes to town.” The latter plot is crucial to Page’s dark fables. The place where the stranger arrives is not usually a town, per se, but the settings of Page’s stories tend to be hostile, isolated, inhospitable zones. If these are not always “the places where things begin,” as the book’s cover copy proclaims, they are certainly the sort of place, like the Galapagos, where things, be they species or languages or stories, mutate into unique, heterogeneous forms—the sort of place where a stranger’s arrival means trouble.